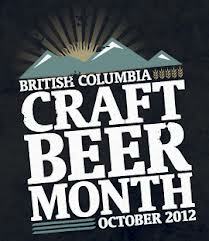 October is upon us which means it is, once again, BC Craft Beer Month (BCCBM). For those of you who do not know, October was officially declared by the BC Provincial Government in 2011 to be BCCBM, a month that, according to the official proclamation, "will feature a celebration of British Columbia craft beer". The month is meant to be a time for those who support the local craft beer industry to shine the spotlight on themselves, by creating their own special celebrations which highlight specifically the world-class, craft beer brewed here in BC and raise awareness as to just how successful and important the craft beer industry is here in this province. More importantly than that, it is an excuse for us who love to tip back a jar or three to get out there and enjoy the BC craft beers that we love. Although it happens less frequently these days, often our local craft beers get over-shadowed by the amazing beers, and the buzz they create, imported from well known craft breweries down south. In my opinion, it was when these great US beers started arriving on the scene here in BC that the local craft breweries really started to push themselves to create and brew more unique and interesting beers to keep up and hold their places in the local market. Although there was a definite craft beer scene here, especially in Victoria and Vancouver where there were some great beers being brewed, it was these US beers that really started to educate the consumer here in BC as to what craft beer was all about and pushed it out into the open, beyond the beer nerd scene and CAMRA crowd. In the past five years or so local brewers have not only managed to keep up with their very talented brewing cousins to the south, but have often surpassed them at their own game which is pushing the limits and challenging the norms of how beers taste and pushing the boundaries of recognized beers styles to create new styles and beers others try to emulate. BC craft beer plays second fiddle to no one these days and one Vancouver establishment, Tap & Barrel, celebrates that fact every day of the year, not just during BCCBM. This is not a review of the Tap & Barrel, although I personally really like the place and love what owner Daniel Frenkel and his staff are doing there. No, you will have to go there yourself to judge whether you enjoy the place or not. I think you will, but I have been known to be wrong before. 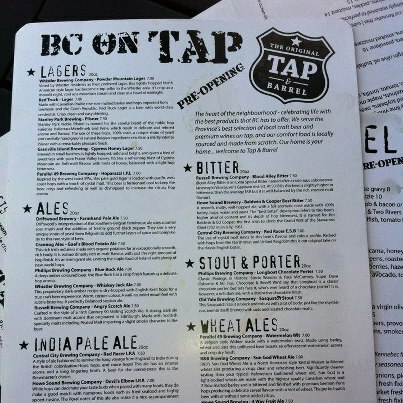 What I want to highlight is the fact that Tap & Barrel has 24 beers on tap and all are brewed in BC breweries. They embrace and highlight the local scene on a daily basis and are none the worse for wear for doing so because our craft beer industry is producing more than enough great beers to occupy the 24 taps on offer there. And they are just scratching the surface, pouring only a fraction of the good BC beers available. Hopefully, as they get going and gain popularity, they can begin to rotate some of their taps and include some of the great beers and breweries that are not currently represented on their tap list. Hopefully, if they are successful, and I see every indication that they will be, more and more establishments will expand their beer menus and will focus more on our locally produced beers. Tap & Barrel are not the only licensee who boast an all-BC, craft line-up, but I do believe they do have the biggest selection of BC-only beers. If I am wrong, please send me word of where I can find a larger selection of BC beer, and only BC beer, on tap. The fact that a restaurant like Tap & Barrel can go with an all-BC, craft line-up on their draft beer list - they do offer some macro lagers and imported beers on their modest bottle list - is something I could never of imagined when I first started enjoying beer back when I had hair and a waistline. I come from a time when three national breweries had a complete stranglehold on the market here in BC and when you ordered draft beer, you didn't even bother to order by brand because they all tasted the same and often pubs only had one brewery's beers to offer. Now you not only have multiple styles and categories of beers to choose from, but also many choices within those different styles. And even as recently as a few years back, although there was a growing selection of craft beers available on the market, many were from cities like Seattle, Portland and San Diego. Now our BC beers are legitimately in the mix and earning more and more tap and shelf space and they are there own their own merit, not just because they are locally brewed. Before I start getting hate mail from those who love their beers from down south, this is not a knock against those brews or the establishments who serve them. Great craft beer is great craft beer and I am lucky to live in a city where there is a seemingly endless supply of craft beers from all over North America and beyond. But what I am finding more often than not is that I am drinking BC craft beer and not just because it is BC craft beer, but because I prefer them over the others available. I can honestly say that about 90% of the beers I purchase and consume are BC craft beers and like at Tap & Barrel, every month of the year is, for me, BCCBM. I think because of the huge wave of momentum the BC craft beer industry is riding on right now, you may see more licensees concentrate more heavily on the local breweries. It would be great if the LDB caught on and stopped restricting the number of listings they give BC breweries, which they should be promoting and supporting as much as possible, not ignoring, especially since domestic craft beer sales are one of the only segments of the alcohol market that is consistently growing. This would help grow the BC craft beer market and as the market grows, it will be able to support more and more breweries giving the consumer more and more choices. What a great time to be a craft beer lover and living in BC! It appears the BC Liberals finally found a way to save face and cancel their plans to sell off the Liquor Distribution Branch's warehouse distribution system. Hidden in a press release from the Ministry of Finance in regards to the provincial government's tentative agreement with the BCGEU for a new two-year contract, it was announced, "(a)s part of the agreement, the Negotiated Request for Proposal process for the privatization of liquor distribution was cancelled." This is welcome news to those who have been opposing how this whole LDB privatization process has been unfolding. I have been saying for a few months now that I believed the Liberals would find a way to back away from their controversial plans but they just needed to find a way to save face and make it look like they were doing it for some greater good, not because of immense pressure from the public and private sectors of BC and the media. At first glance it looks like the BCGEU, who were very vocal in their opposition to the privatization plus, provided that avenue of escape. I think a lot of credit needs to go to the media and bloggers who played a big role in shedding light on what appears to have been some scandalous backroom deals which resembled the controversial BC Rail privatization. On the heels of the HST debacle, it seemed political suicide for the Liberals to try to sneak this privatization past the BC public, but try the did, showing, in my opinion, the arrogant attitude this government has and its disdain for public wants and needs. What will this mean for BC craft beer consumers? Well, we will never really know, but I think in the short term we won't have to worry about potential price increases and restricted access to locally produced craft beer as a result of a private monopoly, accountable to only their shareholders, taking over the warehouse distribution on alcohol in BC. The downside is that we are stuck with the current system, which is flawed and needs overhauling, but at least it is a system that is accountable, to some extent, to the voters of BC. Let's hope all this media attention on the LDB will prompt some positive changes in the future by the next government, which by all accounts looks to be the NDP. I think those wanting reform need to make this need for the modernization of our liquor system an election issue and push to get commitments from those seeking election next May to bring the LDB and the LCLB into the 21st Century. A few months back I met with someone from the wine camp and over a few beers we had an excellent discussion about issues common to both the BC wine and craft beer industries, successes the wine lobby have realized as a result of advocating and how the craft beer consumers could better organize to help them realize similar successes. During this discussion it was pointed out to me the craft beer consumer advocates and the craft beer industry as a whole have a major problem that has nothing to do with the quality of beers being brewed or the lack of organization of the industry and this problem is one that is playing a major role in the lack of support given to craft beer by the government and the hospitality industry. "You (craft beer consumers/industry) have an image problem," I was told. This was not news to me, and should not be for the majority involved with the craft beer scene here in BC. It is a reality and a hangover from the Dark Ages of Beer when with a few exceptions, from Coast-to-Coast in Canada, the majority of beers available were basically generic, mass-produced lagers meant to be swilled for the effect, not the taste. During this Dark Age, beer had no place in the finer restaurants about town, did nothing to enhance or compliment food and was considered a beverage almost exclusively downed by down-and-outs and by middle-class, working men, but thankfully, due to the explosion of the BC craft beer scene and the amazing beers being brewed locally, those days are long gone. A few weeks back my family and I walked into one of our favourite Commercial Drive eateries and I noticed what looked to be a fairly casual wine tasting in progress. I went over to introduce myself hoping to score a sample or two of primo vino and strike up a conversation with others who have a passion for good alcohol and food. Quickly the conversation shifted to the recent Bring Your Own Wine legislation and I mentioned my desire, as a consumer advocate of local craft beer, that the laws be further changed to include beer. That's when I came face-to-face with the reality of the "image problem" facing beer drinkers, whether they be craft beer aficionados or not. I was told, in no uncertain terms, by one of the people at the tasting, that no restaurant owners would be interested in beer being included in BYOB legislation. This fellow, who told me several times he was the owner of five restaurants, therefore knew what he was talking about, went even further and asked who, in general, would be interested in such a ridiculous idea? He dismissed the fact that craft beer consumers would be very interested in this concept. He scoffed at the idea that a beer of any style or quality could compliment, never mind elevate, food if paired properly and told me he had no interest in enticing the craft beer crowds to his restaurants because beer drinkers "only order yam fries". Wow, behold the wine snob. He wanted to hear nothing about the fact he was actually sitting in a restaurant that supported including beer in BYOB legislation. He pooh-poohed that, like with wine, people cellar and age certain beers. He simply ignored when I pointed out that there were a multitude of fine dining, beer-pairing dinner events that sell out on a regular basis around the city or that craft beer lovers are often also equally into their fine wines, single malt scotches and gourmet food. Quite simply, he could not fathom that those who enjoy good craft beer come from diverse backgrounds and have varied tastes and interests just like those who enjoy wine. He offered no solid arguments other than the ideas that wine is more refined than beer, wine drinkers more sophisticated than those who prefer a fine ale, lambic or stout and that selling craft beer was not profitable. It was quite obvious to me Mr Wine Snob was actually quite ignorant of what great beers were all about especially when he ordered a macro-lager to enjoy with his food instead of the craft beer option that paired very well with the style of food being served. Luckily my wife was there to drag me out of the conversation as the condescending and patronizing tone of Mr Wine Snob triggered my inner-Surrey. There will always be restaurants and bars that cater to wine-lovers, just as there are now places like the Alibi Room, St Augustine's and Biercraft who cater to the craft beer crowd, and places that serve only mainstream lagers and European import "premium" beers and that is fine. There are also fine-dining establishments like Vij's and Chambar, who have great wine menus, that offer great beer with their food...for a reason. Because they understand flavours and taste without prejudice. And they give consumers choices. But Mr Wine Snob is not alone. This is part of the response I received from Rich Coleman, minister in charge of all things alcohol in BC when I wrote him about Bring Your Own Beer to restaurants. "While we appreciate the evolving nature and uniqueness of craft beer, it is not in the same category as wine." As a side note, I don't have time for the beer snob either. .If someone gets pleasure from sipping a sleeve of Molson 67, good for them. You won't find it in my glass and what is in your glass does not impact my drinking experience. I do not assume that those who drink these types of beer are inferior to me, or have no clue about good food because this quite simply is not true. And if you want to know, Mr Wine Snob, otherwise known as Chris Stewart, is co-owner of the very successful restaurants La buca, Pied-a-Terre, Cafeteria, Commissary and The Sardine Can here in Vancouver. I introduced myself as the president of CAMRA Vancouver and presented my card on the table, therefore he should have known I was on the side of the craft beer consumer, yet he felt it necessary to insult beer drinkers and make it clear to me they were not good for his restaurants. And after he did so, he gave me his card, without his name but listing his establishments, at which time he once again warned me that they were fine-dining, wine-oriented restaurants - places yam fry eating beer lovers like myself may find lacking even though I had told him several times I had a great love for wine after living in South France for close to three years. I am not telling you to boycott or avoid his restaurants, as I have said, I have heard they are excellent but if you want a great plate of yam fries or a good beer, please take the above into consideration.